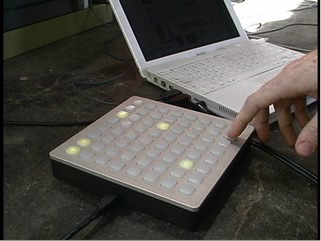 The Monome is a new music interface with LED-backlit pads, a USB interface that transmits OSC and MIDI data to a computer, and — here’s the unusual part — open source, hackable firmware and software interface. Touch the pads, and you can use this as a step-sequencer and remix tool (as in the example), but the real philosophy here is being able to do whatever you want, so think of the example video as just a start. But they’ve also managed to put this in a very professional-looking, USB 2.0-powered box. That’s a big step for a homebrew device. The only disadvantage of the design I can see is that the focus on buttons mean it lacks continuous control, and it’s not velocity-sensitive. Hackable and Open Source: Mapd, the application that routes MIDI and maps the buttons, will be open sourced soon (apparently useful even if you’re not using this hardware). More importantly, you’ll be able to modify the firmware, so you can add additional controls that aren’t currently on the box (get those soldering irons ready). It’s a big contrast from the hardware and software in other experimental devices like the Lemur, not to mention commercial music hardware. We’ll have to wait to see just how useful this is, but it’s intriguing. The designers also promise to include lots of custom software from artists and tips and tutorials for making it work online. Getting your hands on one could be a challenge. US$500 is the price of the first batch; if they sell their lower-quantity batch, though, you could see a more widely-produced model and lower prices. Our friend Chris O’Shea gets the scoop on this one (thanks, Chris). Also on the CDM forums.